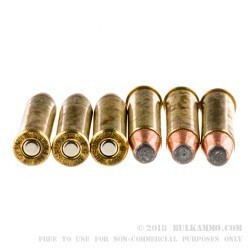 The .327 Federal Magnum cartridge was designed in 2007 to achieve multiple goals in one round. Many shooters wanted the stopping power of a .357 magnum load but wanted more than just the few rounds that most revolvers hold. Then Ruger and Federal ammunition got together and created the .327 Federal Magnum round to bridge the gap. The .327 Federal Magnum is available in multiple weights and bullet types that can fill a variety of roles. 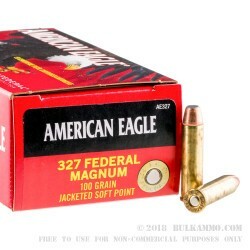 These American Eagle 327 Magnum bullets are copper jacketed, lead core, 100 grain soft point's. 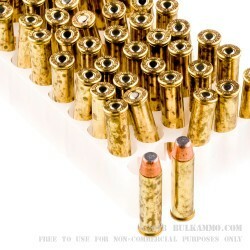 They come loaded into highly polished, thick walled, non-corrosive Boxer primed, reloadable brass cases. These rounds are fast moving and boast a muzzle velocity of 1500-feet per second with a heavy hitting muzzle energy of 500-foot pounds. The 327 Magnum can take small to medium animals like coyote, small warthogs, and other types of game. They are ideally suited for revolver plinking fun, trying out a new wheel gun you just bought, or a lever gun you just picked up and want to take hunting. 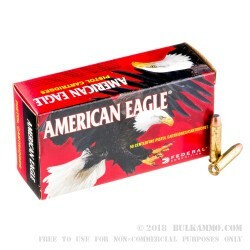 The cartridges come in boxes of 50 rounds and are available in larger quantities. Get yours today for a day or 2 of family fun.